After more than 13 hours on the train, I arrived in the City of Lights - Paris! First place to go? The Louvre Museum! Musée du Louvre is one of the world's largest museum and probably the most famous. It is also the world's most visited museum with an average of 15,000 visitors per day! I pre-ordered my entry ticket to avoid the long queues there. I was impressed at how big the museum is. The most famous resident in The Louvre is Mona Lisa. So I went to look for her. She must be expecting me. I sent a tweet eariler to inform her that I was going to see her! Saw a lot of famous sculptures in the Louvre. By now you should know that I can't really appreciate art. Not for now at least. So I pretended that I could appreciate the beauty of the sculptures and paintings. After walking through the crowd and many sculptures, I finally saw Mona Lisa! And we locked eyes....I was looking at her and she was looking at me. I think she was not all that excited to see me because she was just half-smiling the whole time when her eyes were on me. At least she smiled at me. Like she always does. As I walked away, I noticed that she kept her gaze on me. And she never blinked. I learnt from young that it was rude to stare but she kept staring at me no matter where I walked! Being the nice person that I am, I forgave her. I guess that is what makes Mona Lisa special. I can't believe at how small she is. Really. I mean, the painting of Mona Lisa is a lot smaller than what I have expected. I always thought that it was big. Come on, I bet that you have seen the copy of Mona Lisa's painting many times while you are growing up and must have thought that it was big right? Admit it! As I was walking along Seine River, I stumbled upon one of the world's famous "Love Bridges". What happens is that lovers would write their names on a padlock, affixing it to the railings of the bridge, and then throw the key into the river below. "Love Padlocks" are used by sweethearts to symbolise their everlasting love. Sweet! I was at the romantic bridge known as Pont des Arts. As I was crossing the bridge, I was fascinated by the number of "Love Padlocks" along the railings. And I didn't know that there were so many different designs for padlocks! The Notre Dame Cathedral was my next destination. It was further up along the Seine River from where I was. I was feeling hungry and I saw many people eating something that I have not been eating for a long time - Crêpes! And Crêpes are considered a national dish in France! Since I was at the birth place of Crêpes, I had to eat it. Went into a cafe and ordered Ham & Cheese Crêpe. The waiter was extremely rude and I could see that he didn't like Asians very much. There were 2 other Asian ladies that came in to order their food and they spoke in fluent French but the waiter was very sarcastic and said he couldn't understand their language! Then they spoke in English and he repeated what they said in a sarcastic manner and left. The worst part? A group of Caucasian guys came in and the waiter's attitude totally changed and talked to them nicely and was joking with them. Couldn't believe it! 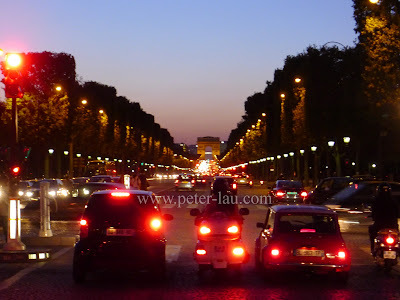 It is not difficult to guess where I was heading next: the most famous icon of Paris -- The Eiffel Tower. Needless to say, this is a must-go place in Paris. The Eiffel Tower and Paris are synonymous to each other and it would be crazy for me not to go. So I went. The Eiffel Tower is the most-visited paid museum in the world. Millions and millions of people ascend the tower every year. For me, I didn't ascend the tower because it was quite expensive (they charge different pricing to the 2nd floor and to the top) and I wasn't with my girlfriend or wife. So it would be super un-romantic for me to go up. And I didn't. Then I went to find the Flame of Liberty. The flame was given by the International Herald Tribune newspaper to mark its Centennial and was a token of thanks for the restoration work on the Statue of Liberty (in New York) by two French businesses. Today, the flame has become an unofficial monument for Princess Diana who died in the tunnel beneath the Flame. Now, it is also known as the "Diana Flame" and is used like a shrine to Diana. Although not an official monument to the Princess, visitors flock around the world to lay flowers and messages to the much loved and remembered Princess. Went to another landmark in Paris -- Arc de Triomphe. Then I walked down the "Most Beautiful Avenue of the World" -- Avenue des Champs-Élysées. This is one of the most famous and most expensive streets in the world. 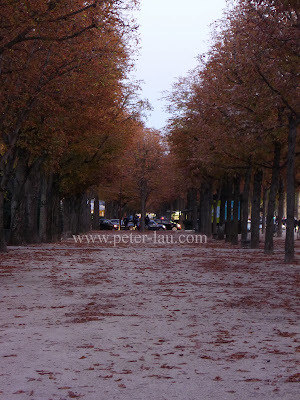 The 1.91km avenue is lined up with cinemas, cafes, restaurants, luxury speciality shops and clipped horse-chestnut trees. Paris is the birth place of Louis Vuitton, and Champs-Élysées is the home of the Louis Vuitton Building since 1913. Champs-Élysées is definitely a place for up-scale shopping. The biggest Adidas store in the world is also located there! As I walked, I saw a beautiful stretch of trees that has orange/red leaves!!! The autumn leaves were so lovely. It was as if I was in a movie scene. No wonder Paris is the most romantic city in the world! Paris is not called the City of Lights for nothing. Went back to the hostel as it getting very late. Rested for a night and got ready to go to London, England! After exploring the capital of France, MY LIFE WAS NEVER, EEEEEEEEEEEEEEEEEEE............................EEEE.......................................EEVER, THE SAME, AGAIN!! !